I was camping for five days, so, yes, in addition to hiking, kayaking, and watercolor, I read two books. Another blog post will follow this one! 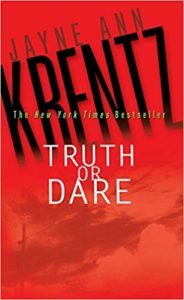 Truth or Dare by Krentz is a fun read. It’s a mystery, not a heavy read, but with interesting characters, especially the women. Zoe and Ethan are recently married, and almost just as recently, acquainted! It seems they just met in a prior Krentz novel, and married within a few weeks. He is a private investigator; she an interior designer with strong psychic abilities. They both bring difficult checkered pasts to this new relationship. Other characters include Arcadia, who Zoe met when they both resided in a mental hospital (from which they escaped); Harry, Arcadia’s new love; and Bonnie, Ethan’s sister. The writing is warm and engaging. There are many threads woven into this narrative, and I was pleased Krentz followed them all, leaving no loose ends, but still causing me to want for more. Truth or Dare lay on my side kitchen table, where books from friends accumulate. I don’t know who gave me this one, but she/he has good taste! Krentz has written over 50 books. I’ll definitely try another in a similar mystery genre (she also writes romance).